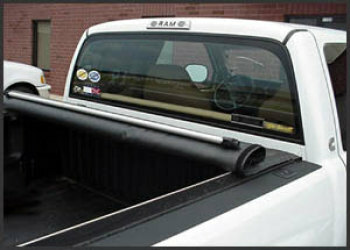 Shopping for a tonneau cover for your '94-'02 Dodge Ram short bed? There are so many different options. From the top-of-the-line, garage-door type, roll-up, lockable covers (priced from $800), to the inexpensive snap-on, bow and arrow type, vinyl tonneau covers (approximately $200 - $225), and all types in between. The choices and combinations are endless. As a retailer, the choice of products for Geno's Garage to sell is endless too. However, our experience with the Literider roll-up tonneau cover by Access has been outstanding. We're confident this is an affordable product that you should consider as you look for a bed cover. No aggravating snaps - The Literider fastens on the side rail with a 1" strip of heavy-duty Velcro. Just run your finger down the side rail to fasten the cover on the sides. Less than five seconds to open/close the cover. No flimsy bows - The Literider "bows" are lightweight aluminum round stock that rolls up with the cover and self-sores at the front of the box. Just roll/unroll to open/close the cover. Less than five seconds to open/close the cover. Inside mounted frame rails - The aluminum (no rust) side frames are mounted inside the trucks side rail or grab rails. Rubber seals on all four sides of the box keeps rain, snow, and dirt out. Weather resistant - Note, we didn't claim completely waterproof. Experience has seen the occasional small leak, but for the most part, the cover keeps the entire bed contents well protected from the elements. Snow concerns? - The manufacturer is headquartered in North Dakota. Enough said. Full use of truck bed - With the expensive garage door, roll-up type covers, you effectively lose 12 inches at the front of the box with the cover's storage bin. While the Literider does have a two-inch header bar that the roll rests on, you effectively have full use of the truck bed. Backed by a three-year limited warranty - As long as you properly install the cover, take care of it and don't abuse it, Access stands behind their product.